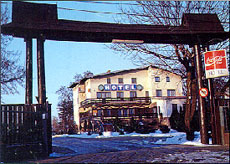 "U Witaszka" Inn is situated in CzosnĂłw, 27 km away from the city center, 27 km away from the main railway station and 25 km away from the main bus station. The airport is 30 km away from the hotel. The Inn location on the premises of Kampinowski Natural Park creates an unforgettable atmosphere and an excellent place to stay for individual guests and tourist groups. The hotel feautes 18 comfortable single and 2 double rooms. The rooms are equipped with a telephone, bathroom, shower and TV. To our guests disposal is a conference rooms. The restaurant serves delicious dishes of Polish traditional cuisine and the kitchen personnel is ready to meet all your requirements. Guests can relax and have a drink in a cozy bar. The hotel organizes meetings, conferences and roasting the beef or pork. Car park is also available. 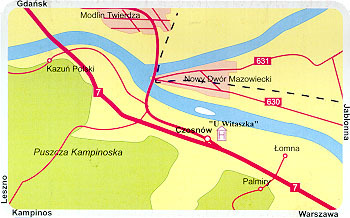 You can get to the hotel by using bus PKS line Warsaw - Nowy Dwor Mazowiecki.